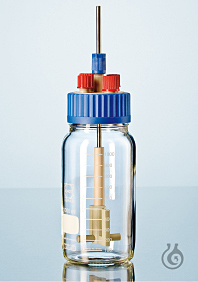 The GL 80 stirred reactor is suitable for a wide range of laboratory mixing processes. During the mixing process, media may be added to or removed from the bottle via the outlets (2 × GL 14, 2 × GL 18). Materials: polypropylene/PTFEE/PEEK/stainless steel. Tmax = +140°C. Fully autoclavable. A sterile pressure equalizer or an additional media bottle can be connected by means of components of the connection system (outer diam. of tube: 1.6 - 12.0 mm). Drive for the stirrer is provided by a standard commercial magnetic stirrer. The variable stirrer shaft can be used in DURAN® GLS 80 laboratory glass bottles (1,000 ml and 2,000 ml) and provides notably improved mixing in comparison with standard magnetic stir bars. The agitating element is replaceable; operation at up to 500 rpm possible. Typical applications: mixing of liquids, dissolving of solids, simple fermentation processes.